As I think of small things that have made a significant difference in my life, consistently studying the Bible is at the top of the list. I have struggled in this area for many years, specifically with a lack of consistency, desire, and motivation. My struggles with it have mirrored my understanding, or lack thereof, of how God relates to me. When I first became a Christian, my Bible study (time in the Word, quiet time, whatever Christianese term you want to use) was defined by legalism. In high school and college, I read the Bible pretty much everyday because it was on my list of what a good Christian does. I read for knowledge and I read out of obligation. If I missed a day, I felt extremely guilty, sure that God was mad at me. After many years of this, in the depths of self-condemnation, I just quit going to the Word altogether. It just felt like another plate to spin in my legalistic life. Plus, if I went to God, He would just tell me more things I wasn't doing well enough. Obviously, I had no true concept of God's character, but, thankfully, He revealed Himself to me in a way that changed my entire life. During that period of time, I had to rethink everything and almost relearn God. I struggled to understand why, with grace and with the Holy Spirit doing the work in my life, I needed to consistently spend time in the Word. My pendulum swung from legalism to the other end of the spectrum and, although the Bible then came alive to me when I read it, I ran from anything that looked like legalism. Spending time in the Word is about relationship, not knowledge. It's about the heart, not the head. Knowledge and wisdom will come, but I have to approach it as spending time with the Person of God. Just like I wouldn't like it if my husband brought me flowers out of obligation, God wants nothing to do with it being our obligation to come to Him. The purpose is to listen. 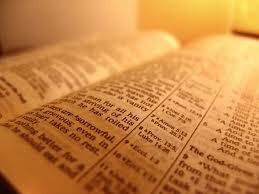 When I read my Bible, I am making myself available to the Spirit of God. That is why consistency is important. The more I make myself available, the more opportunities He has to speak to me. God is the initiator in the relationship. I'm not trying to conjure up anything or figure things out. I'm just making myself available and letting Him be God. I love Psalm 27:8: "When You said, Seek My face," my heart said to You, "Your face, Lord, I will seek." It's my job to respond in obedience when He speaks. The more I read, understand, and meditate on about who God is, the more my heart turns to Him in thankfulness and joy. It's a cyclical effect. Legalism can have no part in the Christian life because it removes the Holy Spirit from the equation. Legalism keeps us trying to make everything happen on our own (and always failing), but the Holy Spirit is the only one who can actually grow us and produce fruit in our lives. There does, however, need to be an element of habit in order to be consistent. The question is: is it a task to mark off my checklist? or am I doing it as a means of making my heart available to God? So, now, after over 20 years of being a Christian, I'm starting to figure things out just a little. The most important thing I've learned is that the few minutes I spend in the Word each day may be a small thing, but it's able to make a huge difference in my life.